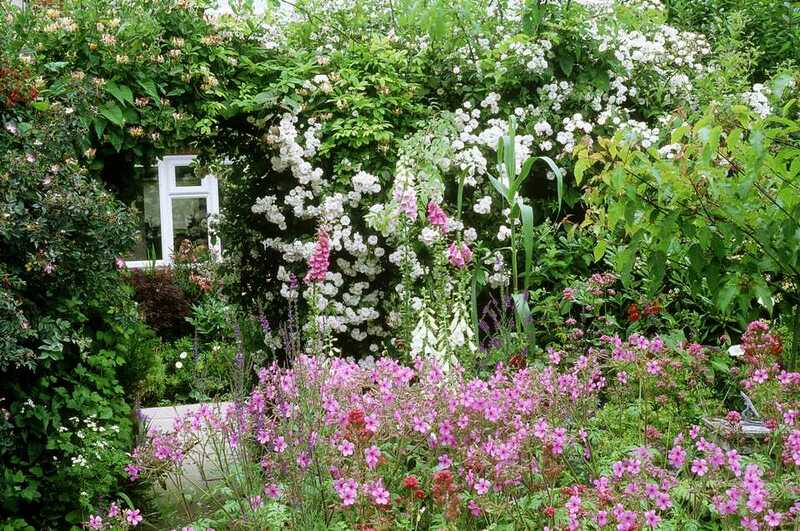 A list of traditional cottage garden plants will encompass quite a variety. We probably think first and foremost of some of the most beloved flowers in the world. But in the list that follows, you will see other types of plants, as well. This is because such planting s were, traditionally, more than just something pretty to look at. It is believed that the peasants who tended them needed to harvest food, culinary herbs (used for seasoning, etc.) and medicinal herbs from their plantings. Thus, in addition to the herbs you see listed below, the typical cottage garden might have contained apple trees. The inclusion of stinging nettle on this list of traditional cottage garden plants may surprise some. It is a type of "weed" that many of us think of as a nuisance. But stinging nettle, when cooked properly, serves as a nutritious pot herb. Note that holly shrubs and yew shrubs could have functioned in hedges, serving the practical purpose of keeping out livestock. The list at the bottom of the page provides just a sampling of traditional cottage garden plants. Click on the links that accompany the entries to learn more about those particular plants. These selections for cottage garden plants are based on a list of flowers in the Shakespeare Garden at the Brooklyn Botanic Garden. As their Web site says, "This charming garden in the English cottage-garden style exhibits plants mentioned in the Bard's poems and plays." Observe that, in some cases where the Brooklyn Botanic Garden lists a particular species of a cottage garden plant, I merely list the genus, to avoid undue pedantry. Thus "garden sage" is included in my list simply as "sage" (do note, however, that the ornamental sage, 'Victoria Blue' salvia is also well regarded as a cottage garden plant). Besides the herbs listed below, herbs with fragrant leaves, in general, would probably have been popular as cottage garden plants. The sweet-smelling foliage of an herb such as sweet woodruff would have been valued as a useful commodity. Such foliage could have been harvested and used to mask unpleasant odors in an agricultural setting in which there was no such thing as running down to the corner store to buy Lestoil.